AFR relies on the intelligence of the body and its innate desire to heal itself and return to a state of wholeness. Injury and habitual patterns of holding tension in the body can cause muscular, neural and joint pain; headaches; poor posture; a lack of cohesiveness and stability, and a sense of separateness. 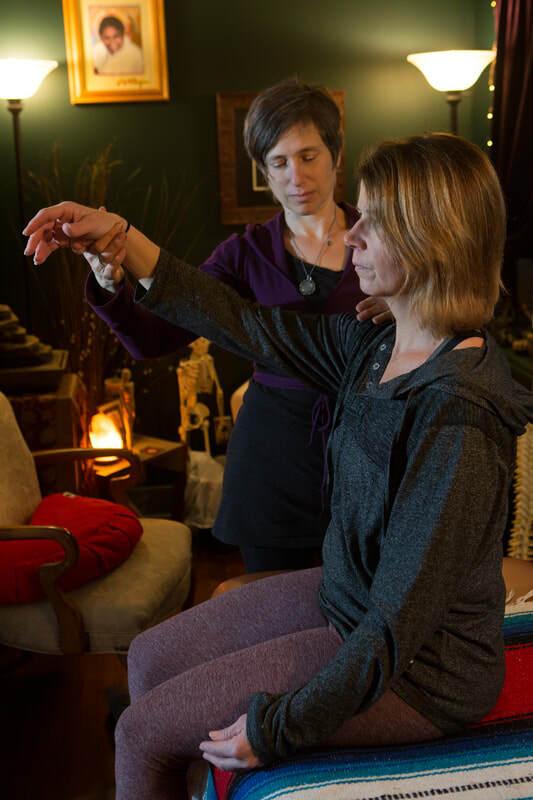 With knowledge of the fascial network and an instinctive trust in the process, Bonnie “listens” to and watches the clients body during guided motion as it reveals a pattern of action that will unwind the fascia and release constricted muscle tissue. As the fascia unwinds, movements in an arm might release tightness in the lower back, for example, or reveal and possibly release a tension pattern elsewhere in the body. People have reported lessening of nerve pain, ringing in the ears, low back pain, headaches and migraines. This gentle technique also can mitigate shoulder injuries, concussions and groin injuries. Along with improvements in physical conditions, clients often report a general sense of wholeness and calm. There is exciting research that suggests the nerve endings most abundant in the fascia are what active the area in the brain known to be responsible for our ability to be self-aware (Craig, A. D. (2008). Interoception and emotion: A neuroanatomical perspective.) This can in turn lead to a greater feeling of being at home in our body.